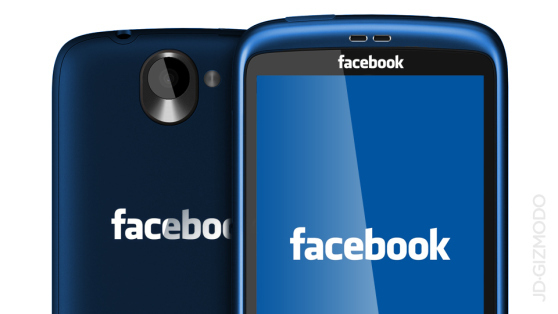 Facebook is set to announce this Thursday the release of the Facebook Phone in partnership with HTC. According to the latest mobile report from The New York Times, the plans are to manufacture the first smartphone designed around the total social/sharing experience that Facebook enables. Maybe it’ll be called PhoneBook? Ugh. On paper, it’s a really good idea. More than a billion people use Facebook on a regular basis to connect with friends, weigh in on political ideas, and just generally brag. And as it turns out, MOST of them are posting, liking and commenting from a mobile device. And yet, with all the Stanford MBAs on staff in their marketing and operations departments, is there anyone there voicing an opinion that this is a thinly veiled brand extension that’s simply designed to appease shareholders with a strategy to create more revenue streams? Because, let’s face it folks, that’s what it is. The subtext of the “exciting” and “new” direction for Facebook is to have another screen for advertising. Period. Facebook’s entire valuation was built – however hastily, however erred – on the idea that a billion+ eyeballs is a road paved with advertising gold. Add another screen, and you can charge another scale. The new rate card must be getting a design makeover just like the news feed. But that road to gold, being paved this week with this mobile announcement, is pocked with obstacles. From a marketing perspective, these three obstacles indicate a likely FAIL and another rough year for Zuck & Co. Obstacle #1: A partnership with a questionable partner. Facebook is partnering with HTC, a manufacturer that, as of the end of 2012, has less than 5% of the total global smart phone market share. What’s worse, the HTC moniker is inextricably linked with another epic fail of corporate overreach, RIM, and the BlackBerry platform. Why not partner with the #1 or #2 player? With the heft of Facebook, why not approach Samsung or Apple and design a custom “version” of their popular phones designed more smartly around the Facebook experience? The full version of Android (the HTC model is using a modified version of the system,) or iOS would provide more seamless integration into the consumer’s current mobile experience. Facebook is still acting like a startup strapped for cash, when it should be carrying itself with the mien that they ALREADY have a seat at the big boy table. Brand extensions are a dangerous proposition, even in the best-case scenarios. And in this case, (which is not the best case,) it’s super-duper dangerous. As it stands, the consumer already has the option to have a BETTER piece of hardware than HTC, (with S3 and the soon-to-be-the-most-popular-phone-on-the-planet S4 or any of Apple’s iPhones,) a BETTER piece of software via the Facebook app on either the Droid or iOS platform, and the chances are the consumer ALREADY owns a device she’s happy with. So it’s highly unlikely that someone is going to rush out and buy an inferior piece of hardware, running an inferior operating system to run an OS that’s focused on a social network so they can take pictures and post status updates from their home screens. The rest of the world already does that with relative ease and great enthusiasm. Obstacle #3: Increased operational workflow and costs. As if Facebook doesn’t have enough going on internally, (acquisition plans, acquired partners spinning off, implementation of contextual advertising, implementation of graph search, etc.,) now they’ll have to add a bunch of new pieces. This might include a coding team to fix v.1 bugs, a customer service department devoted to mobile, internal teams to interface with HTC, a dev team to work on v.2 and beyond, marketing and advertising expenditures around the device, operations around packaging and distribution and on and on. Yeccchhh. I’m no Stanford MBA, but when you have increased operational expenditures, increased marketing expenditures and are projecting – at best – to penetrate a 5% piece of the pie, chances are you’re going to have to dip into your pocket to support this new initiative with a boatload of short-term cash. Zuck, here’s my advice. KILL this deal before it erodes the stock price and further erodes consumer perception about Facebook quickly becoming the “uncool” social platform. – Blame HTC as an unreliable partner. – Cite your unusually high expectations for the platform as a reason to delay the rollout. – Say you’re working on even bigger and better features and you think you’ll roll out by Christmas.